My first book, Original Sacred Harp: Centennial Edition, is printed and on its way to the publisher’s warehouse in Georgia. We will be officially launching the book at Emory’s annual Sacred Harp singing on Saturday, February 14, 2015. Front cover of Original Sacred Harp: Centennial Edition. We will celebrate the book’s publication with a joint session of the Emory singing and the annual meeting of the Society for Christian Scholarship in Music. I’ll give a short talk placing the book in the social world of its editors and describing its “musical conservatism and material modernity.” We’ll then devote the first session of the Emory singing to participatory singing from the Centennial Edition. Sacred Harp singers will take turns leading songs from the new book and I’ll chime in here and there with comments on the songs, the tunebook, and their makers. The debut presentation and singing will take place from 9:45–10:45 am in Emory University’s Cannon Chapel. The event is free and open to the public. Please join us! Noon and 3 pm: A tour of an exhibit on hymnody and psalmody at the Pitts Theology Library including Watts, Wesley, and selections from the library’s collection of shape-note songbooks. A talk by Joanna Smolko on the history of Sacred Harp singing in Athens, Georgia, also part of the SCSM conference session. The Original Sacred Harp: Centennial Edition reprints the entire contents of the 1911 tunebook in meticulously reproduced facsimile, preserving the book’s quirky then-modern typographical style. The book features a new introduction by Jesse P. Karlsberg placing Original Sacred Harp in historical and social context, describing how it came to be published, and detailing its reception and legacy. 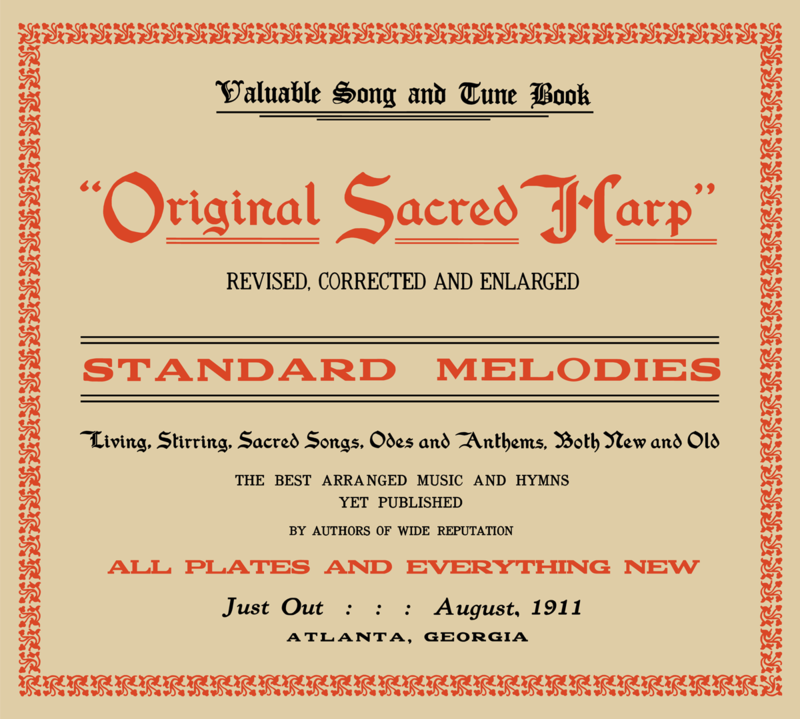 A handsome hardbound volume reproducing the 1911 tunebook’s original cover, Original Sacred Harp: Centennial Edition makes newly accessible James’s fascinating historical notes and a trove of engaging music.